Is one of your car’s side windows shattered and needs replacement? Our licensed technicians in the Denver area will replace your car window quickly and effectively, protecting your car’s interior from weather and theft. Unlike windshield and rear windows that are laminated, the glass in your car’s side windows is made from tempered glass. Tempered glass is produced from a single-ply sheet of glass that underwent controlled thermal processing with temperatures as high as 1250 degrees. Tempered glass is five times stronger than normal glass, so it offers additional safety to your vehicle and prevents your car windows from breaking into sharp pieces when they shatter. Instead, when tempered glass shatters, it breaks into rounded dull pieces causing minimum damage to the passengers. Due to the nature of the manufacturing process, when a chip or crack occurs in tempered glass, the whole window needs to be replaced. While a temporary fix may hold the shattered window in place, ultimately it leaves your car at mercy of weather elements. 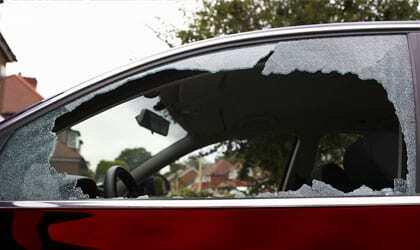 Shattered side window also makes your vehicle and possessions vulnerable to theft. At Jiffy Auto Glass, all our technicians are certified to replace auto glass professionally and efficiently. We can come to you, wherever you are. We offer both in-shop and mobile auto glass replacement. Tempered auto glass replacement doesn’t take long. We can change your glass window in as little as one hour so that you can get back on the road as soon as possible. If you have a broken side window, back window or vent window, and live in the Denver, CO region, contact Jiffy Auto Glass, Colorado. We have amazing prices and great service! Call Jiffy Auto Glass if you need a window replaced in your vehicle.